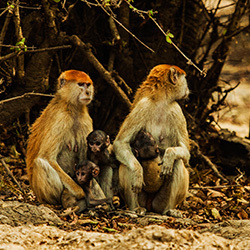 Mole National Park has over 90 species of mammals. 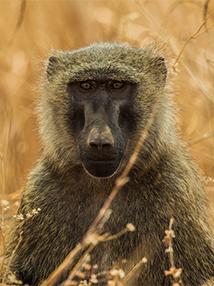 Elephant, buffalo, kob, warthog, waterbuck, bushbuck, roan antelope, hartebeest, duikers, oribi, patas monkey and green (vervet) monkey are the species commonly seen at Mole National Park. Aerial surveys of the large mammals have been carried out between 1993 and 2006. Predators in the Park include spotted hyenas, leopards, caracal, civets, genets, jackals and mongooses. Even though there are lions in the park, their population and home range has declined, making their presence and sighting rare. The lions (pantheraleo) and elephants (laxodonta Africana) found in Mole National Park are currently listed as vulnerable on the IUCN red list of 2004. The spotted hyena, buffalo, oribi, roan antelope, kob, duiker and reedbuck are listed as lower risk on the same publication. These species require particular management to thrive. Studies have been made of the avian life in Mole National Park, and a full report can be consulted (Dowsett, 2005). Over 300 bird species have been recorded, many of which are migratory birds heading to or from Northern Europe. The Carmine bee-eater and Saddle-billed stork are particularly stunning, and all will appreciate their beauty! Mole is unique in its bird populations: all 37 recorded Guinea-Sudanian biome species found in Ghana are here in the National Park. If you are a keen bird watcher, Mole is a must! As well as the species mentioned earlier, you are almost guaranteed sightings of martial eagles, the white-headed and palm-nut vultures, herons, egrets, the Abyssinian roller, the violet turaco and the red-throated bee-eater, to name a few. There are 33 reptile species in the Park. The Nile crocodile, slender snouted crocodile and dwarf crocodile can be seen in the rivers within the Park. More than 50 butterfly species have been spotted in Mole National Park, including the Anthenetalboti, which is usually limited to East Africa. Mole is the only part of West Africa where this species has been recorded. The total butterfly fauna is probably about 120. Most are typical of the Guinea savannah belt. Two species of Euphaedra were found: the genus is mainly one of the understorey of true evergreen forest, but the two species in question seem well established in dense woodland in the park. The West African savannah habitats are generally not species rich, and there is virtually no endemism. True savannah butterflies constitute about 15% of the total Ghana butterfly fauna of more than 900 species. The best season for butterfly studies in Mole is between late May and early June. The dominant vegetation of Mole National Park is open savanna woodland with grasses that can reach 3 metres high during the rainy season. Burning plays an integral part in the maintenance of this vegetation. Bovals are open areas of short grassland which are found on areas with shallow soils and iron pans. Narrow bands of riverine forest grow along most of the streams. Other plant communities, such as swamps and flood-plain grasslands, cover only small areas. Most of the 742 plant species found in Mole are widespread throughout the savanna zone. However, the species of conservation value (4 endemic, 12 disjunct and 24 species which are rare or have a very limited distribution) is relatively high. Their abundance is generally low and they are often confined to small areas. Since 1916, plants have been collected from within the present area of Mole National Park, with the bulk of the collection carried out during the Aberdeen University Expeditions and J. B. Hall's studies (Hall, 1976c). Hall published a provisional check-list (Hall, 1976c) containing 719 species and subspecies. An extended list including the authors' samplings (November/December 1992 and February/March 1993) has been compiled by Schmitt and Adu-Nsiah, 1993. It contains 739 species of vascular plants which include 148 tree, 61 shrub, 166 grass and 281 herb species, 75 climbers and 8 ferns. Local endemism is generally low in West African savannah, and only two endemic species are confined to northern Ghana: Kyllingaechinata, a sedge, and Aneilemasetiferum var. pallidiciliatum are found in Mole. In addition, three species which are endemic to Ghana were recorded, namely Gongronemaobscurum, Raphionacmevignei and Rhinopterysangustifolia. The 11 disjunct species of Mole are confined to savannah woodland, with the exception of Mimusops kummel, a tree found in riverine forests. Five species have been identified in Mole which have not been recorded elsewhere in Ghana: Croton pseudopulchellus, Indigoferaconferta, Indigoferatrichopoda, Jatrophaneriifolia and Pleiotaxisnewtonii. Anthocleistavogelii, a tree of wet sites in the south-western forest zone, was recorded for the first time in Mole. Apodostigmapallens is a climber which is normally also restricted to the forests in the south-west. Amblygonocarpusandogenesis, a savannah tree widespread in central, east and south tropical Africa, was recorded for the second time in Ghana. Approximately 38% of the plants recorded in Mole are also found in the forest zone. 39% of them (or 15% of all Mole plants) were classified as 'non forest species' by Hawthorne and JuamMusah (1993). 461 or 62% of the plants found in Mole are savannah species. This includes the subspecies of Togo hare, L. victoriae, mentioned by Wilson, 1993. Hutchinson and Dalziel, 1954-72; Hall, 1976c, 1979; Brunei et al., 1984; and Hawthorne and JuamMusah, 1993, Flora of West Tropical Africa, FWTA).